Take an unforgettable journey beyond the Arctic Circle to the world's northernmost settlements, where you'll sail through mountainous islands known for spectacular beauty and quaint towns. By day, you'll explore culture, history and natural beauty along Norway's rugged coastline. By night, you'll watch the skies for the Northern Lights. It's a vacation unlike any other! Click the Itinerary tab to learn more about this spectacular tour, then book online or call a destination specialist at 1-888-937-8474 to begin planning your Norway vacation. Shore excursions, optional tours, and gratuities for tour manager & local guides. Land only price does not include arrival/departure transfers, but does include flight Oslo-Kirkenes. Transfers are only included with arrival to Gardermoen Airport (OSL). Please note that the time the ship stops at each port is subject to change and cannot be guaranteed. Please see the port schedule for approximate times. Please note: Northern Lights viewing is subject to correct weather conditions and sightings cannot be guaranteed. This is a moderately active trip. We spend 2-3 hours on our feet during tours. The pace is also moderate, however you will encounter some uneven and slippery surfaces, stairs, steps and significant slopes. This tour is not recommended for people who have difficulty walking or who have heart conditions. Hurtigruten cruise ships are working vessels operating a regular service to a set timetable. The ship carries goods, vehicles and passengers between ports, by night and day, as a unique and integral part of Norwegian daily life. The ship calls at ports around the clock. You may expect some noise and vibration in a few cabins during loading of goods. Please be aware that Norway is an expensive destination. This is an Off Season program. For more information, click here. *Northern Lights viewing is subject to correct weather conditions and sightings cannot be guaranteed. Please note that exact time in port will vary per sailing. Please see port schedule listed in Additional Information for more details. Optional tours are available for purchase on board. Please visit this link for tour information. MS Kong Harald has its own onboard Expedition Team and serves as a university at sea. MS Nordkapp comes fully equipped with panorama lounge, sun deck, observation deck, and her own expedition team. 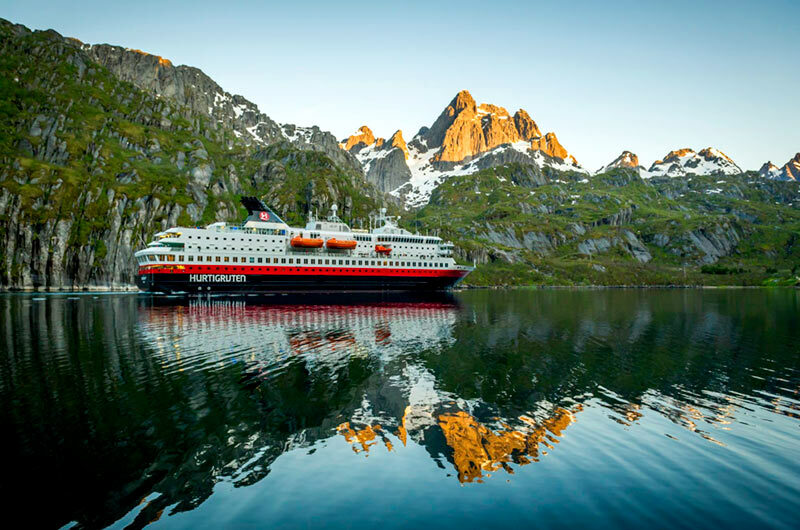 The Trollfjord is the MS Midnatsol's sister ship, and they share many of the same characteristics, like a beautiful panorama lounge and suites, with extensive use of Norwegian wood and stone. This superior tourist class hotel is located amidst calm surroundings, within a short distance from Karl Johans Gate shopping street. This first class hotel is situated very centrally in Bergen. Admire the highlights of Norway's great seafaring tradition as you enjoy a guided visit to two of Oslo’s most intriguing museums, the Viking Ship Museum and Kon-Tiki Museum. On your first stop, you will see three 1,200-year-old ornamented Viking ships, which are the best preserved in existence. These incredible artifacts were uncovered from historic burial mounds together with contemporary 9th-century artifacts. The museum is most famous for its wholly complete Oseberg ship and the unique insight into life during the Viking era it offers. Continue to the Kon-Tiki Museum where you will see the fantastic vessels the Ra and Kon-Tiki. Thor Heyerdahl gained worldwide fame when in 1947 when he crossed the Pacific Ocean on the balsawood raft, the Kon-Tiki. This expedition, along with subsequent voyages on the reed boats the Ra and Tigris showed how early man had mastered sailing before the saddle and wheel were invented.